Although this cheese and cracker snack combo is offered by a few different brands, these two were on sale, so that’s what I got. I’ve always considered this type of offering to be a second-rate snack in general. For some reason it sticks out in my mind when I was in college and working at Crabtree and Evelyn in the mall and my manager was working a billion hours because the store just opened. 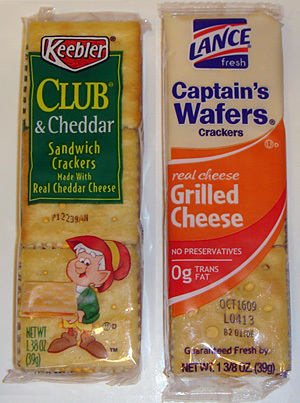 We always had candy or chips in the back room that we’d snack on but one day in the middle of her open-to-close shift she sat in the back room and pulled out one of these sandwich cracker packs and said “finally some real food!”. I remember being confused and asking her why she didn’t just go to the food court (though not much better, a little closer to “real” food) but she declined and was content with the crackers because they had cheese in them. I just remember wondering when she was going to get sick considering the amount of hours she worked and that she counted these as a substantial meal. She looked pretty bad by the time I quit. Anyway, my mom just happened to be in the neighborhood after I got home from the store and FINALLY got a cell phone so she called to see if I was around and just in time to help evaluate these! Mom and I both noticed how butter these crackers were, which we liked. The salt was just enough too and I felt it really complimented the butteriness of the cracker. Mom felt that the cheese had a chemical taste to it while Ethan and I had trouble tasting the cheese at all. It was just there for texture as far as I experienced. Mom felt the cheese was the same in this with it’s chemical taste. I could taste the cheese a little more, not so much the sharpness of cheddar but it did add a creaminess that Keebler lacked. Ethan said he still didn’t really taste any cheese. 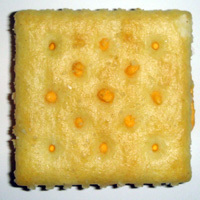 The cracker was less buttery and salty but more dense, which mom liked. Mom liked the Lance crackers better because of their density and felt like a more substantial snack and Ethan and I went with the Keebler. I liked the intense butter flavor of the crackers and Ethan didn’t specify in his notes (he conveniently came downstairs right after my mom left and tested these with his own). Lance sent me a case of their various crackers. Despite their obvious promotional effort, I still buy them after giving the case away. They are tasty and cheap! I LOVE the Keebler crackers. They are so damn cheap and there is something about them that has also convinced me they are closer to real food than a bag of Doritos. Can’t explain it, maybe long hours at monotonous yet stressful jobs alter your brain’s ability to understand what food is at all. I haven’t tried Lance, but I can most definitely vouch for Keebler’s deliciousness. They have multiple flavors, I believe I tried the jalapeno once, but it’s best to stick with the original. I always associated the “good” Keebler crackers with the peanut butter ones. They were school lunch inclusions for many years! What’s with that bright orange cheese from Lance? It looks so fake. 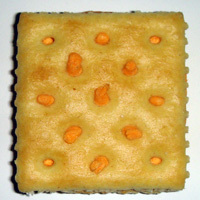 I like the look of the keebler cracker. Buttery = yum! Lance makes Cape Cod Chips. Lance crackers are very good! Keebler crackers are too buttery for my taste. I recently bought 2 packages of 8-pack cheese cheddar sandwiches and out of the 8 packs there were 4 of those packs (consisting of 6 sandwiches) that had 3-4 sandwiches that had NO cheese fill at all and were just crackers. One or 2 here and there is understandable but that is not acceptable for the price that is paid. Why is this happening? I use to work for Lance, and at that time they also made the club crackers for Keebler (don’t know if they still do), so this all may be for nothing.